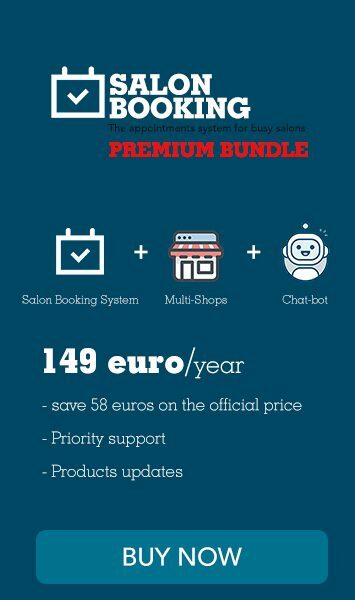 Salon Booking System 3.22 is now available - read more..
We are ready for a new release of Salon Booking that will bring you a set of new interesting features. Finally you can add one or more discounts to the reservations from the back-end. To do that you need to activate “Advanced Discount System” option from “Settings > Checkout” section. You need to create your desired discounts, and from that moment you’ll be able to add them to the reservations straight from the WordPress back-end. We’ve added this new option inside the assistants details page that will allow a single assistant to receive more than one reservation during the same time slot. This option is very useful for those who provide class rooms where more than one person attend the same date/time class. We’ve added a new tab inside the “Booking my account page” where users can update their personal data. We’ve also integrated Salon Booking with “WordPress Privacy Exporter and Eraser” API. Now the website owner is able to export and erase all the users information collected by Salon Booking system.